AT the eastern end of the 75 tram route (Stop 75), dismount and cross to the northern side of Burwood Highway, turning right then left into Hanover Road – heading north and proceeding gently downhill. Take the second turning on the right (east) into Woodleigh Crescent. As you walk along this leafy street, look for glimpses of the Dandenongs ahead of you. At the end of the street, you cannot miss our first park – it is the huge Terrara Park, and you have a handy gate for entry. Looking to the north-east, you can see clubrooms, a carpark, toilets and a green space with a playground nearby. Cross the park to explore these facilities and then exit through the carpark in a westerly direction away from the clubrooms. To the right, you will also see a drainage easement running North West, which could also be used if it is not muddy. Continue until you reach Terrara Road near its intersection with George Street. Look to your north, and about 200m away, there is a large sign for “Bellbird Dell”. This entry point is clear, and there is also a smaller signpost to “Bellbird Dell North”. Here there is a very nice picnic area, a small playground, drinking water and a small lake! Look for flowering shrubs, many birds and listen to the bird songs. This is not a park to be hurried through! The main path runs to the north, but there are lots of “distractions” including birds and boardwalks. 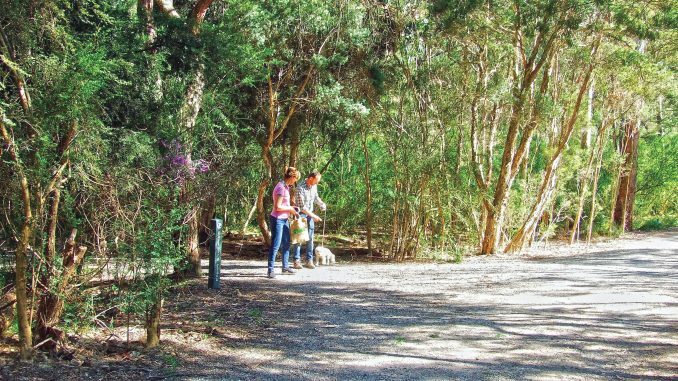 Continue on this central path to the northern end of Bellbird Dell – exploring the side paths as you go if you wish. There has been extensive tree planting and landscaping over the 40-year history of the park. After about 40 minutes, you will reach the end of the track. Now turn back the way you came. On the return walk, after just 200m you pass again a small playground, with drinking water and exit paths to the east and west. For the first time, I suggest that you make a choice for the rest of your walk. A simple route would be to return exactly the way you came, back to Vermont South Shopping Centre. This seems to be a popular choice for the friendly locals, and their very well-behaved dogs! I would probably choose it too, if the weather were warm and sunny. Bellbird Dell is shady. However, here is an alternative, which goes through several other interesting parks and streets in this area, along with some great views. This route begins just south of the playground, where you choose the right hand Sheoak Track, (signposted, near some post and rail fencing) and head to the west. After five minutes, exit Bellbird Dell, turning left (opposite Barnaby Place) along Nurlendi Road (not signposted). This road is winding and has many “no through streets” off it, with an interesting selection of designer homes. After 10 minutes, you will reach a major road (Terrara Road). Looking right, by the roundabout, you will see a sign to the “Horticultural Centre”. Cross over Terrara Road, go right, then left, into Jolimont Road and continue west until you reach this Centre. This walk takes about 15 to 20 minutes, and just before the Centre, on the right, you pass a coffee shop, which could be a good spot for a coffee break. Alongside the Centre, just off the road, there is a substantial community garden and grassy open space. At the south-west corner of this parkland, you can walk past the large community garden shed, then across wide open parkland to a north/south pathway near Parkmore Primary School. See how many landmarks and buildings you can identify from this area. Once you see a windmill (yes, there is one here! ), head towards it and you will join a path that runs beside it. The seat just past the windmill has fine views of the Dandenongs. Continue west to Springvale Road through Whitehorse Botanic Gardens, which are part of the now abandoned Healesville Freeway reserve.